I still have all the old Comrades shirts, never worn them. No idea why but Mrs P cant understand why they have a special box with the medals, patches etc and the shirts from the UK Group (I received this years last week). Was in Mugg and Bean when you were all having that photo taken, with a friend from the UK who travelled with me. Couldn't move …. but the alcohol in the afternoon at Joe Cools helped with that later in the day. TCP BA LHR-JNB-DUR ArrJNB6th09:15Dep15:40ArrDUR16:45 Ret? Hi Peter, acupuncture? Wow, that is amazing. Good to see you getting back into your stride. You need to de-box those medals and display them, hopefully you will need 10 pegs after this year, or will that be 11, do you have a back-to-back medal too? I do have a back to back medal, but it was the year when they last did the double down do they are not standing back to back but I recall they face each other. I guess that will be the same next time they do a double down. Ooo I love the sound of that face to face medal! It must be the rarest of medals? You need to photo that and post it here well done on the run, keep it easy! i am doing the Brighton marathon on 14th April and will be in South Africa running or not. No problem mordo, that's what the list is for sorry you have been in the wars, that is a remarkable jump in mileage having been out for a while; take care! I'm delighted to report that Son of 1owrez will be coming to London and our evening meal; he is not an ultra runner, or in fact any kind of runner, and appears to be quite well adjusted even though his father is exhibiting some strange mid-life crisis trends It is going to be interesting asking a pasta restaurant to provide gluten free food for him! And I might be late, as I'm hoping to run Ranscombe Spring Challenge that day, so I have to get back up the M2 and then (after shower & change of clothes!) into London. "In a recent meeting between the National Federation - Athletics South Africa (ASA) and the Comrades Marathon Association (CMA), the CMA has been instructed by ASA to strictly adhere to the below rules which you must comply with. As per IAAF Rules 4.2, 22.1 and 142 (refer to the IAAF website) and Athletics South Africa (ASA) Rule 9 (refer to the ASA website), in order to participate in the 2019 Comrades Marathon, you are required to submit a clearance letter from your National Federation to ASA and the Comrades Marathon Association before the event. These rules apply to ALL athletes regardless of whether professional or recreational runners. If you have already submitted a clearance letter, ignore this reminder." Becca - Hope you're having a great time in Tokyo. Have a great race on Sunday. I have just had my highest mileage week and month ever. Surprised the legs are still working. lowres, I can look up the menu and give you my order in advance so you can order for me to save time, if I'm running (pardon the pun) late? Southern Snail: well done you! I am expecting Jamie to cook our meals himself: bish, bash, bosh, done so we wiw ave bags o time innit naaaaah wot oi meeen o-rite dalin! Good to see you taking a bit of a rest Debra; I worry about all those miles you do; and would be dancing in the street if I could crack 27 in a 5k (in a dress). Wonder how TCP got on? I recall I dawdled for the first k or so because I was saving myself for the (right man) marathon the following day, but I got sick of meandering about so I put the after burners on and had a fantastic time. 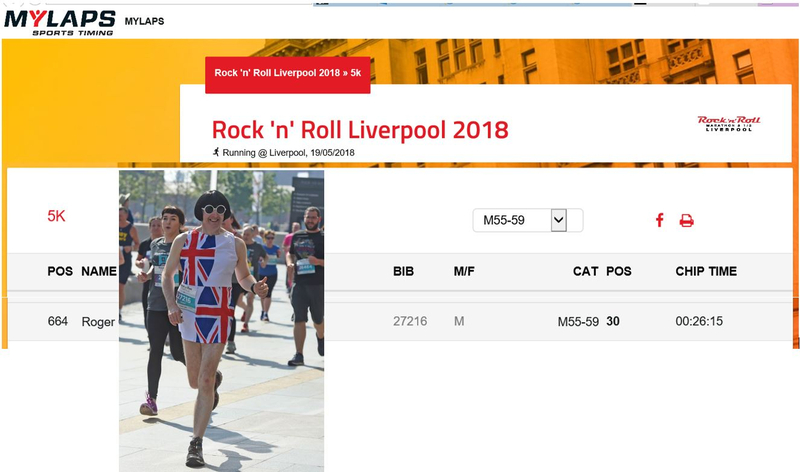 My husband beat me at last week's parkrun, with a new PB of just over 27 minutes - he's doing really well on parkrun plus two other runs a week (or was until he sprained his ankle getting up from his desk on Monday - I kid you not - so is having to have a week off). lowrez, I thought that it was a good thing, probably, to have a couple of weks of really low mileage. But not this long. And as Southern Snail says, I have the Samphire 100 next weekend. I was aiming for sub-24 hours. Now I'm more aiming to get to the start line and hope to be able to keep going and finish. Good luck for Tokyo Becca. Regarding the email about clearance letters, my 'guy on the inside' tells me that if you email [email protected] stating your name,club and UKA licence number and ask nicely for a letter, all will be well and you will get an email back with said letter attached. Apparently they have been inundated today with requests! If you aren't affiliated to a club/UKA then not sure what path to take. Possibly try them regardless and hope they are feeling helpful! They usually mention this on the website, but only 'elites' needed to worry about it, but it seems they are being much stricter this year and we all have to comply. A bit of a pain really. Maybe people were winning categories and not having the right paperwork? Who knows. Thanks Max - Looks like I might need to join a club! Ha! What a palava, I will hate doing that and wasting their time; I'm never going to turn up! lowrez, what's your marathon count so far? The letter thing was a fun curve ball this morning. Seems the easiest way to get a registration is join UKnetrunners. When you have the number EA a very quick at sending the required doc over. lowrez, i asked because if you've reached 50, including ultras, you have the right to join the 100-marathon club as a 'wannabee'. Although as Matt has reminded me there are some online clubs - I was a member of one several years ago, as it was free. Can't even remember which one it was, now. I'd forgotten when I joined Striders of Croydon, but UKA had it on record and I had to have my first-claim club officially changed. I hope your running is going well and you are on track for Comrades. I managed a good week last week with a Phoenix marathon and a great 22 mile run in the Peak District. I love that place. Some advice please. I got an email from Comrades saying: "you are required to submit a clearance letter from your National Federation to ASA and the Comrades Marathon Association before the event." What is this? What do I have to do?